It was a fair question. 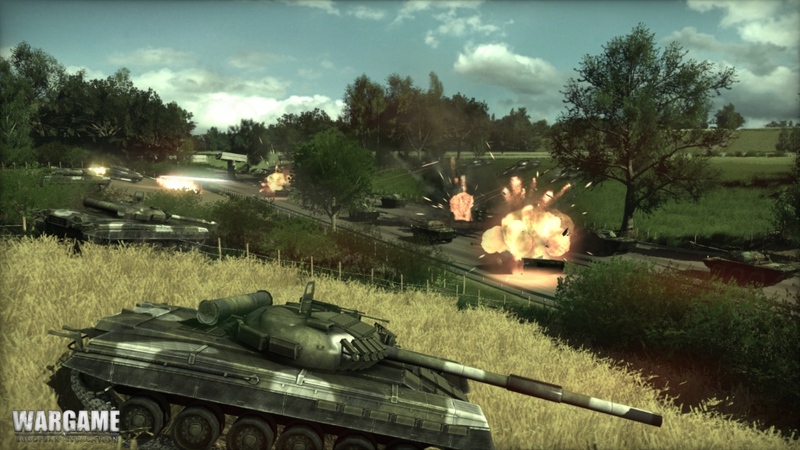 The publicity screenshots are spectacularly useless at telling you what Wargame is. Vanity shots like that are good for marketing the game to the wow-graphics crowd, but they also need to be mixed in with screenshots like this, which are what you spend 99% of your time in game actually looking at. See? That’s got much more information in it. I suspect that just by looking at that screenshot you can make an educated decision about whether or not Wargame is a game for you. Just by looking at it you can see that it lives up to its title: this is a wargame, not an RTS, with a level of mechanical complexity far beyond what you’d typically encounter in the genre. It is a game where you can send in tanks against BMP-1s and have a reasonable expectation of success, but those same tanks will be crushed by BMP-1Ps. Knowing the difference that one letter makes is what separates victory and defeat in Wargame, and that’s going to justifiably turn a lot of people off of the game. There is a lot of information to take in here and you have to invest several hours simply learning about the basic capabilities of the units at your disposal and the weapons they carry. Until you do you are going to lose. A lot. I don’t blame you if that doesn’t sound like your idea of fun, and if it doesn’t you are highly unlikely to enjoy this game. If it does sound like fun (learning how to identify several dozen different variants of Cold War era NATO and Soviet military tech, not losing repeatedly) or if that’s a burden you’re willing to shoulder in order to get to the meaty centre of the game, then you should know that Wargame is very, very good. Eugen Systems have learned from Ruse, their previous title, which was game that fused together an RTS with some light wargaming elements and ended up being just a little bit too abstract, a little bit too gamey for what it was trying to do. 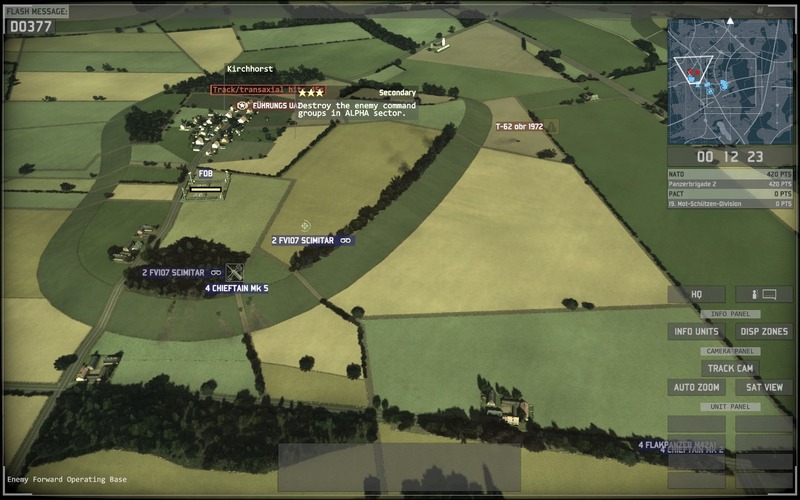 Wargame does the reverse: it fuses a wargame with some light RTS elements, and it’s a marked improvement since the interest and the reward in this kind of strategy game lies in the details. So, what is Wargame actually about? 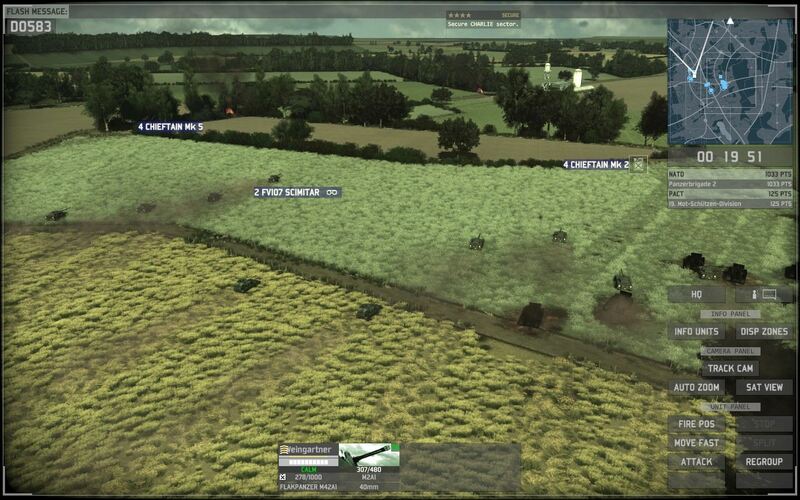 Wargame is a grand strategy game where dozens of tanks, helicopters, armoured vehicles and even tiny little infantry men slug it out over maps that can measure up to fifty kilometres on a side. Pretty much everything you’d expect to be modelled in a serious wargame is modelled in some way here. All units have separate ammunition supplies for each weapon they possess, and the vehicles have the additional consideration of fuel to deal with. 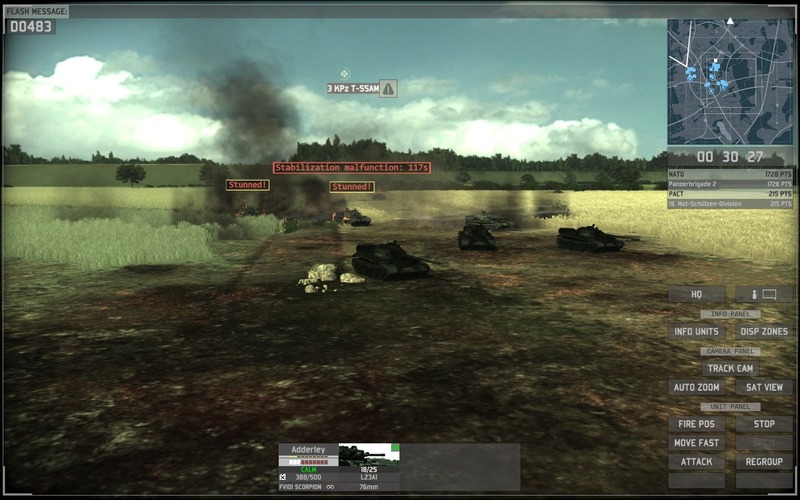 A tank platoon might consist of four tanks but each tank in the platoon will be dealt with as a distinct unit with its own armour and morale values; they are merely grouped together for ease of movement. If a unit gets panicked its performance on the battlefield will suffer badly – weapons will take longer to aim and they’ll be far more inaccurate when they eventually do fire. Panicked units can even rout entirely, retreating to a safe spot until they recover their wits, and this morale mechanic can make it extremely effective to, e.g., soften up an attacking tank unit with some otherwise-harmless rocket barrages that nevertheless spook the crews to the point where they miss all their shots when they finally get in range of your tanks. This makes the supply of your forces a primary consideration when playing Wargame. Thankfully the actual resupply mechanic is very simple: you simply move a group of supply trucks or helicopters within a certain radius of a unit that needs fuel/ammo/whatever and as long as both sets of vehicles are stationary the unit will automatically be resupplied. Supply vehicles only have a limited amount of supplies, and when they are drained they must head back to a Forward Operating Base to stock back up. FOBs are large supply dumps that can only be placed at the start of a game, and they constitute the closest thing Wargame has to a “base”, but even losing your FOBs won’t knock you out of a game completely. The only thing that will do that is losing all your command vehicles. 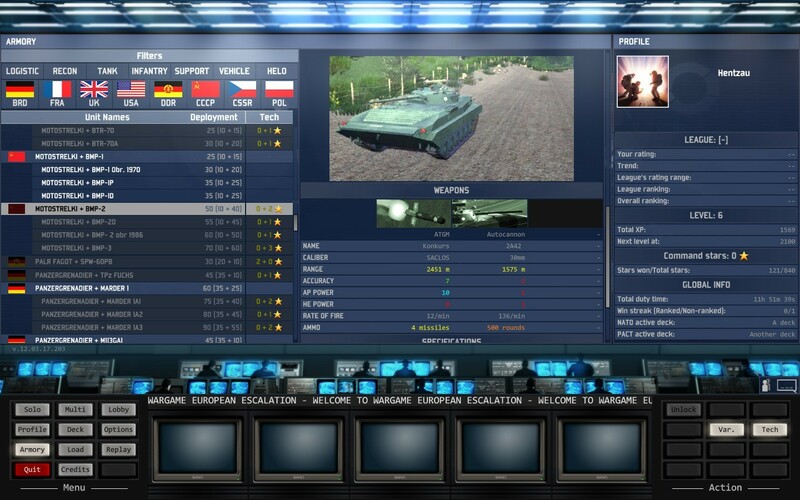 Wargame’s maps are divided into sectors which can be taken and held by your forces to get deployment points – the game’s resources – but only if you have a command vehicle present. Command vehicles are very expensive, unarmed, and have little to no armour, so they absolutely have to be screened, concealed and protected by your other forces. Killing an enemy command vehicle means partially crippling their resource income and their control of the map; losing one of yours is a harsh blow that can often take most of a game to recover from, if you manage it at all. Having a command vehicle out in the open is suicidal since an opponent will happily sacrifice a couple of cheap helicopters in order to get at it (and the unarmoured ones can be taken out by a single infantryman), so they have to be sequestered inside forests and hedgerows where they won’t immediately be spotted and destroyed. This brings me neatly on to the third key element of Wargame, which is reconnoitering the terrain. 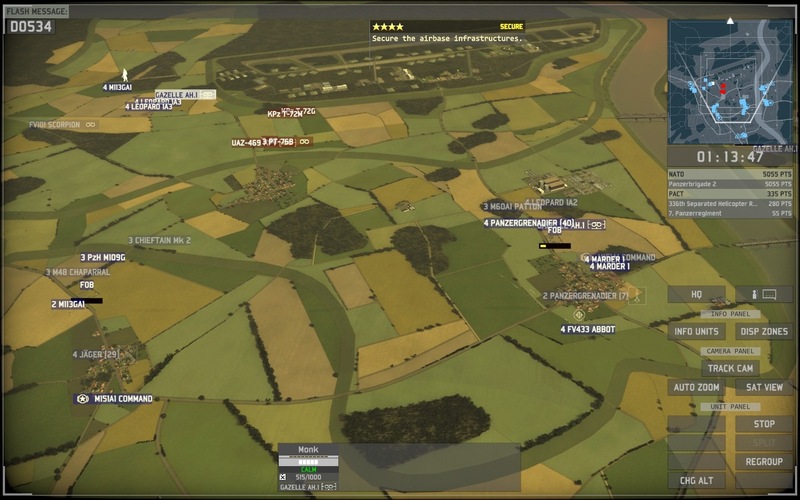 There are only two real types of terrain in Wargame: open, and dense. Open terrain is what you’d expect; lines of sight are modelled accurately so if there’s a unit over the brow of a hill you won’t be able to see it, but otherwise it’s business as usual. Dense terrain is where it gets interesting. Forests, hedgerows and towns all count as dense terrain. Move a unit into one of them and it becomes hidden. A hidden unit can only be revealed by either moving one of your units right up next to it (this is suicidal) or else sending in a recon vehicle first to check the dense terrain out. Recon vehicles have very good optics that let them spot concealed ambushes before they actually run into them, and so it’s crucial to lead up a probing attack with a recon element to make sure you’re not about to encounter an anti-tank guided missile team hidden in a woodland somewhere.up ahead. Inside forests and towns, therefore, the usual power dynamic between units is reversed; infantry are very good at hiding because of their small size and have powerful short range anti-tank attacks, so any tanks sent into a forest blind will be destroyed in short order. The same goes for LAAD teams and SAM vehicles, which turn unscouted areas around forests into complete no-go areas for helicopters. These are unit which would be chewed up if they were caught on open terrain, but which are all-powerful if they can attack from a position which makes the most of their strengths. The actual combat in Wargame is rather conventional. Each weapon has a high explosive rating, an anti-tank rating and an accuracy rating. High explosive weapons are good against unarmoured targets and anti-tank weapons are good against (duh) tanks. When a unit is hit by an attack, first the game checks to see if it’s got any armour on the side where it was hit, and then it compares the strength of the weapon to the strength of the armour to see if it does any damage. Side, rear and top armour is far weaker than frontal armour so there’s a certain amount of positioning involved, but in general your units are intelligent enough to angle their fronts towards the enemy, absolving you of any micromanagement duties and letting you leave them to get on with it while you deal with things on the macro scale. What I particularly like about Wargame’s combat is the way the supply mechanic has allowed the developers to balance certain weapons. For example, the ATGM teams I mentioned above – and ATGMs in general – are cheap and pack a fearsome anti-armour wallop, but the supply of missiles each unit gets is very limited and once they run out that weapon is completely useless; if the unit has no other weapons to fall back on that unit will be completely useless. Helicopters are mobile and deadly but exhaust their rockets in a few salvos, and so they periodically have to be pulled back to FOBs to re-arm. Tanks are expensive and bad in dense terrain, but their ample supply of shells gives them a lot of staying power in a fight and their fuel supply allows them to range fairly far ahead before they require the attentions of a supply truck. This balancing element is something that’s badly needed because there’s something like 200-300 different units in Wargame. Many of them are simple variants, like a BMP-1P is pretty much just a BMP-1 with a Konkurs ATGM stuck to the top, but balancing that lot must still have been a complete nightmare. Somehow Eugen Systems have more or less managed it, though. Unit cost is something which factors into it since your opponents will get the point value of whatever they manage to destroy added onto their score, leading to much screaming when a pair of 200-point Apache helicopters get taken out by a group of three cheap 30-point Chaparrals. The large unit pool is something that actually helps, too; no matter what unit you field, there’ll likely be something somewhere inside the opposing arsenal of 150 units that’ll act as a hard counter. That is, if you added it to your deck before the battle. Here we come to the one part of Wargame I have a problem with: the decks, and the unit unlock system. The decks are not offensive in and of themselves; there’s absolutely no way you could be given access to all of the units on your side at once and not suffer from information overload, so you have to add specific units to a custom-made deck before the battle begins. This isn’t so bad except for it being completely unexplained, and it takes a couple of games to get a feel for what the decks will and will not let you bring to a battle. No, the real turd in Wargame is the unlock system. Those 300 units I said were in the game? Most of those are locked to begin with. You can’t use them, instead only having access to some really basic infantry, tank and recon units. To unlock new units you have to get some command stars, which are earned both through playing multiplayer games and completing missions in the single-player campaign. This leads to a situation where the difference between a level one player and a level twenty player isn’t one of experience or ability, it’s that the level twenty player will have access to units that are straight up better than what the level one player can field, since they won’t have access to any of the counters. The system is one that is ostensibly supposed to encourage people to play the single player and to stop them from being overwhelmed by so many unit types all at once, but it’s still something I have an inherent philosophical problem with. When I’m playing a multiplayer game I like the playing field to be level, and I have a strong distaste for mechanics which hand concrete advantages to the people who have played the game longest. It’s a forgivable sin, though. You can get enough command stars through playing the first tutorial campaign (although it’s still harder than the main campaigns of most conventional RTSes) to put together a worthwhile NATO deck, and its smooth sailing from there on in. Wargame is an accomplished, mature strategy game for people who like strategy as opposed to mere micromanagement. The only thing stopping me from unequivocally recommending it is the fact that the multiplayer community for this game doesn’t appear to be that lively – and remember, I’ve been playing in the week following a Steam sale. If you don’t have a group of friends who also own the game you’re going to have to content yourself with the campaign and skirmish modes, and while those are fairly good in their own right they’re probably not something I’d pay £20-30 for. If you do have such a group of friends, and if you relish a meaty strategy challenge of the kind Wargame provides, then get thee to Steam and buy this game next time it goes on sale. I promise you you won’t regret it.